In West Oakland, food justice activists often begin presentations with the following statistic: The neighborhood has roughly 30,000 residents, and about 50 liquor stores, but nowhere to buy fresh produce. However, after years of food justice activism, that is no longer the case. Worker-owner James Burke expands on this idea: “I think a lot of people in the community are happy just to have another place to shop that offers a different kind of variety than what you see in the other locations here. But for those that understand more about who we are and what we’re trying to do, you’re seeing people from the community, people you might even see on a regular basis, and now they’re part of something. They’re not just employees, but this is their business and they’re opening in their community trying to support their neighbors.” Not only does Mandela bring fresh produce into West Oakland, it offers the opportunity for local economic development through community business ownership. Mandela Foods is the centerpiece of Mandela MarketPlace, a non-profit food hub and business incubator that also includes a produce distribution company connecting small farmers of color to community-owned businesses; a network of corner store owners excited to feature fresh produce; and an educational program providing health and wellness workshops and cooking demonstrations to families and community groups. Together, these initiatives are working to change not only the local food landscape, but the broader social and economic landscape as well. “It was more for practical reasons,” Mariela continued. “How can we have a business that is owned by the community, that people have equal power in how its run, and have equal profits from how its run and have equal say in how it’s run. And so, that, by definition, is a cooperative… If you look around at Bay Area [cooperatives], it’s mostly white people who either have a network with resources or have their own personal finances that are able to start this kind of business because that’s the idea that they have in their head. This cooperative would have never have happened in West Oakland. 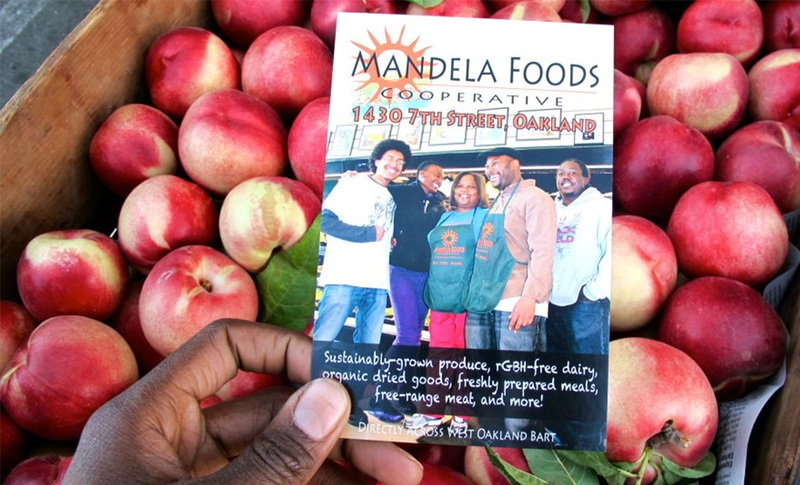 The reason we established ourselves as a non-profit to support and incubate Mandela Foods is that four worker owners from West Oakland didn’t have the credit or the networks or the access to the kind of financing they would need to build something.” West Oakland food justice activists turned to a cooperative model because they felt it could best guarantee community ownership. But the co-op remains tied to a non-profit organization so that the latter can provide resources and services that coops founded by wealthier people might access through personal and professional networks. Mandela is a part of the growing struggle for food justice that has begun to take root between the cracks of busted sidewalks in some of the poorest neighborhoods in the US. Food justice activists go beyond support for the creation of sustainable food systems—those that do not rely on the use of toxic chemicals that harm the soil, water, wildlife, and bodies of workers and communities living nearby, and which limit the amount of fossil fuel necessary for local distribution. They also work to dismantle inequalities of race, class and gender. In both the industrial food system, as well as in many, more environmentally sustainable alternatives, race, class and gender strongly influence who has access to what kinds of food, as well as the roles that individuals and communities play in its production and distribution. Food justice activists such as those working at Mandela believe that sustainable alternatives created by and for communities that lack access to healthy food can encourage locally-led economic development, addressing inequalities throughout and beyond the food system.